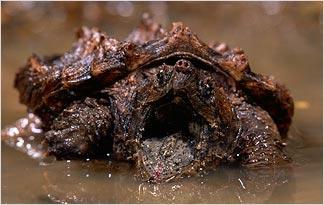 One of the most fearsome Chelonians around is the alligator snapping turtle, Macroclemys temminckii, which is the biggest freshwater turtle in North America. It can grow to 2.5 feet long, can weigh as much as 200 pounds, and has powerful jaws, a sharply-hooked beak, nasty bearlike claws and a muscular tail. The alligator snapping turtle does eat some aquatic plants, but it's mostly a carnivore that dines on a variety of smaller creatures -- fish, frogs, snakes, worms, clams, crayfish and even other turtles. The alligator snapping turtle catches prey by way of a fiendishly clever evolutionary adaptation: an appendage to its tongue that, when wriggled, looks an awful lot like a worm, according to the Saint Louis Zoo. A fish who gets fooled by the turtle's tongue will swim right into range of the hungry predator's jaws.